Just when you think Tony Abbott's decision in 2014 to restore imperial knighthoods couldn't become any more bizarre, the prime minister uses the Australia Day's honour list to award a knighthood to the Queen's consort Prince Philip. History editor and Queensland ARM convenor Dr Glenn Davies reports. THE MONARCHISTS have been asking themselves, with theAustralia Day honours list announcement upon us and the Queen’s Birthday honours list in June, who should be nominated for an AK or AD award? 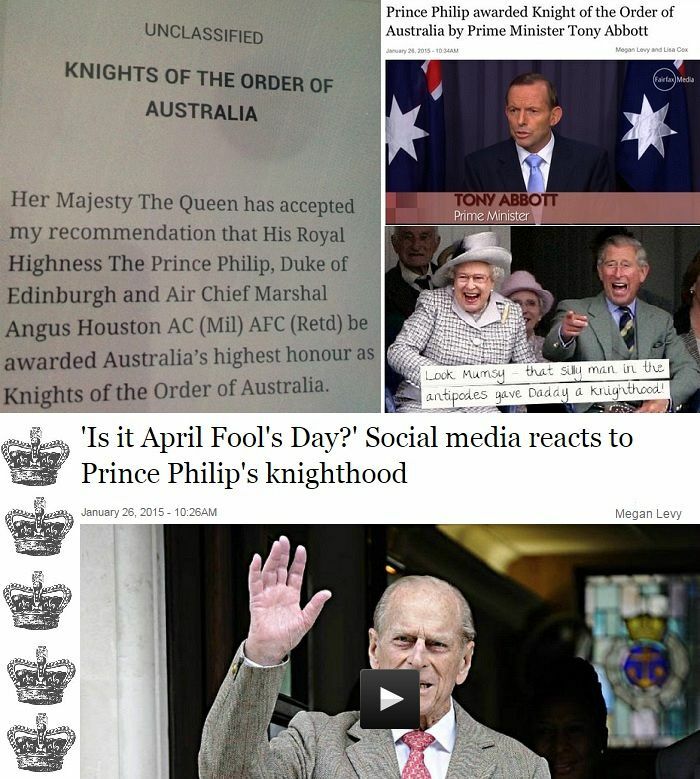 The real question is: would Prime Minister Tony Abbott dare name any knights ‘n dames in 2015 after the level of satire it inspired last year. In the lead up to Australia Day 2015. there had been no media about the awarding again of any Australian imperial honours. The Australian of the Year awards had been well publicised but not the possible "Knights and Dames" appointments. On 27 March 2014, I wroteabout how Prime Minister Tony Abbott, the former director of Australians for a Constitutional Monarchy, announced the return of imperial honours for Australians. On 19 March 2014, on the Prime Minister’s recommendation, Her Majesty The Queen approved amendments to the Letters Patent for the Order of Australia to reinstate appointment of Knights and Dames of the Order of Australia. For the first time since 1986, “pre-eminent” Australians were to be honoured as Knights and Dames in the Order of Australia. The three Australian "Knights and Dames" created last year were: The Honourable Dame Quentin Bryce AD CVO, former Governor-General of Australia; His Excellency General the Honourable Sir Peter Cosgrove AK MC (Retd), Governor-General of Australia; and Her Excellency Professor the Honourable Dame Marie Bashir AD CVO, Governor of New South Wales. Today it was announced the second and third AK’s to be awarded in the restored Knight of the Order of Australia division are His Royal Highness The Prince Philip, Duke of Edinburgh and Air Chief Marshal Angus Houston (retd).One is currently the Chair of the Council for the Order of Australia, and the other … well, the husband of the monarch. "Knights and dames in the Order of Australia are approved by the Queen on recommendation of the prime minister. We wouldn't comment further on the process." What could be more Australian than a £10 pom awarding bigoted old British aristocrat an imperial bauble on Australia Day? I'm misting up. Still, it’s rather glaring as to which has the greater conflict of interest. The monarchists have been excited about turning the clock back and been suggesting names for knighthood such as tennis great Rod Laver MBE, the living Victoria Cross recipients, Australian Nobel Prize winners (even posthumous), previous GG’s, retired Generals and Chief Justices. Interestingly, one of the only two pre-1985 AK’s living is Prince Charles and, with the provision that a knight can be a non-citizen, I’d suggested good money could be laid on Princes William or Harry receiving a knighthood in 2015 for having turned up in Australia a few times. On that logic, perhaps one should also be given to Prince George, who showed us exactly what he thinks of the ex-convicts with his instantly disdainful chuck of the toy bilby at Taronga Zoo. There’s even the depressing thought Rupert Murdoch (now a U.S. citizen) could be in line for a knighthood! I was not far off though. Instead it was the Grandfather Royal, Prince Philip, who received an AK for his contribution to Australia throughout the Queen's 62-year reign and it was his his long life of service and dedication PM Abbott chose to be honoured by Australia. Special mention was also made of the Duke of Edinburgh Awards in Australia, which he said had positively influenced the lives of hundreds of thousands of young Australians. It was Prime Minister Gough Whitlam who axed knighthoods in 1975, only to watch Malcolm Fraser reinstate "Knights and Dames" a year later. In the Australian honours system, appointments to the Order of Australia confer recognition for outstanding achievement and service. The Knight/Dame of the Order of Australia is awarded for extraordinary and pre-eminent achievement and merit in service to Australia or humanity at large. It is now the nation’s highest award. Governors-General become a Knight or Dame of the Order of Australia by virtue of their appointment as Governor-General. In addition to Governors-General, there will be a maximum of four appointments a year, excluding honorary awards to non-Australian citizens. However, when Prime Minister Abbott named outgoing Governor-General Quentin Bryce a dame and her successor General Peter Cosgrove a knight the satirists had a field day. The re-establishment of the Imperial honours was done quickly and without consultation by PM Abbott with his Federal front bench, let alone the first two recipients. IA columnist Bob Ellis statedthat Prime Minister Abbott wanted to distract and deflect, as well as punish and shame his Opposition counterpart and abruptly came up with his plan to ennoble Quentin Bryce. Senior correspondent Barry Everingham wrote that former Governor-General Ms Quentin Bryce heard of her “elevation” on the ABC's 8.30am radio news and that the Queen heard from an aide who was contacted by a member of the Australian media. Everingham also observed that Prime Minister Abbott trashed vice-regal protocol in the last moments of the term of Quentin Bryce as Governor General, at the same time as causing grave offence to the monarch. Imperial honours are divisive and are out of touch with modern, multicultural, egalitarian Australia. “This decision to appoint more knighthoods is the end result of the politicization of the system under Tony Abbott. We had a perfectly good honours system run by Australians. Placing the Knights and Dames system over and above that is demeaning the worthiness and opinions of Australians." On 27 March 2014, when PM Abbott introduced the archaic British aristocratic titles above the Australian national honours system, Australians flooded the Australian Republican Movement with such overwhelming numbers the Australian Republican Movement server was on the verge of crashing. "Since Mr Abbott’s announcement about 'knights and dames', our annualised membership growth rate has spiked to about 5000%. Many are re-joining, having previously been members. Many are people who say they voted for Mr Abbott’s Government but are dismayed by his personal decision, apparently made only in consultation with the Queen." Perhaps another own goal by the Prime Minister may be good for the movement towards an Australian republic. In an Australia Day eve book launch speech, Leader of the Federal Opposition, Bill Shorten urged Australians to support an Australian republic and head of state, arguing it would reflect the nation's "modern identity, our place in our region and our world". We now appear to have two federal political leaders divided clearly along monarchy and republic lines. We should be advocating a fully and unambiguously independent Australia, no knights or dames required. How ridiculous! Find out more about the Australian Republican Movement at ouridentity.org. #AUSpol "@DrElizabethGran: Stevie Goldsmith #loveyourwork #AustraliaDay #invasionday pic.twitter.com/jie3wMCGqZ"